With the increasing number of tourists visiting Sanya Nanshan Tourism Culture Zone, Nanshan is planning to build itself into the leading tourist site in Hainan within a few years. During the recent 2 years, the number of tourist arrivals to Nanshan scenic spot reached more than 3 million, with annual tourism revenue totaling 400 million yuan. To promote the Nanshan scenic area to the world, the site has invested more than 2 billion yuan to develop its core landscape traveling mode consisting of the following sites including the Culture Center of Godness, Nanshan Temple, Valley of Longevity and Moon Bay. 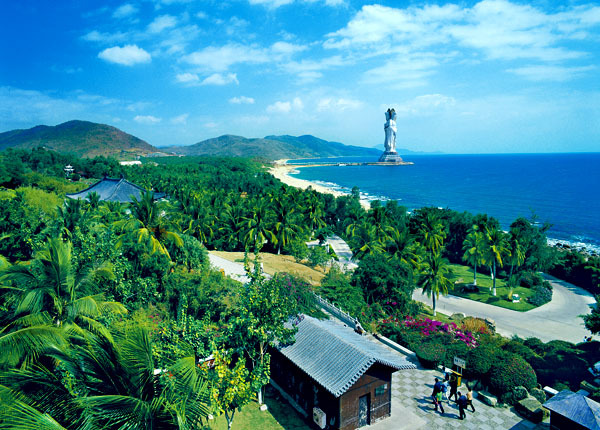 Under the background of the Hainan international tourism island, Nanshan is taking the opportunity to further combine tourism with landscaping and Buddhist culture and make Sanya an international tourism destination for its pleasant climate and healthy lifestyle. Even though Nanshan is not one of China’s four famous mountains for Buddhists, Nansha will be further promote it into a sacred mountain for Buddhist culture in China and in the world. A Buddhist representative from Taiwan expressed his best hope on the Nanshan development.